Emerging mobility trends could also cause disruption through reduced fuel demand and tax revenue, a new report finds. 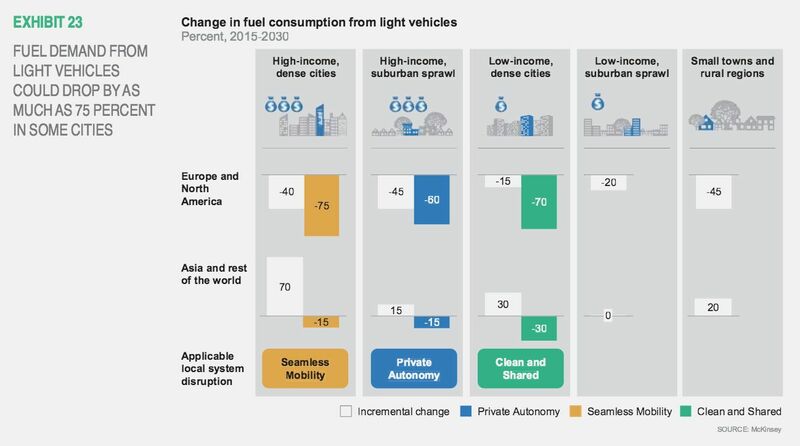 Vehicles and the ways they are used are expected to change more over the next two decades than in the last 100 years, propelled by the new mobility trends of vehicle electrification, shared mobility and autonomous driving. Additional factors, such as access to public transit, air quality concerns, urbanization and the decentralization of the energy system are also triggering changes in the mobility sector. The ‘Private Autonomy’ model, in high-income suburban sprawl areas, where passenger miles traveled could grow by 25 percent by 2030, due mostly to autonomous vehicles. The ‘Seamless Mobility’ model, in densely populated high-income cities like London and Singapore, where electric vehicles (EVs) could represent as much as 60 percent of all vehicles on the road by 2030, the result of low-emission zones, consumer interest and favorable economics. "Cities are most prone to accelerated uptake based on a ranking of metrics, including income, population, government effectiveness, level of public-transit development, congestion, and pollution," according to the report. "Each model can deliver significant benefits, such as saving time, reducing congestion, and improving air quality." Researchers quantified the possible cumulative societal benefits of each model over the next 15 years and found the societal gains in densely populated developed cities will be largest, amounting to $7,400 per person -- or $30 billion to $45 billion for the average developed dense city -- between 2015 and 2030 in the Seamless Mobility case. In the Private Autonomy scenario, benefits will amount to $3,300 per person. And in urban areas following the Clean and Shared model, where private car ownership continues to dominate, societal benefits will amount to $2,800 per person. Benefits stem primarily from improved safety, reduced vehicle emissions and reduced congestion. Each of these outcomes will have an impact on downstream oil and gas players by reducing local fuel demand from light vehicles, but the extent will likely vary by city and region. "In places that see a rapid transition toward a Seamless Mobility or Clean and Shared system, local demand for light vehicle fuels may decline by as much as 75 percent between 2015 and 2030," according to the report. A separate report released earlier this year by Wood Mackenzie found that Tesla’s Model 3 will spur the widespread adoption of electric vehicles, which will in turn reduce U.S. gasoline demand by 300,000 barrels per day by 2035. “Sectors along the mobility value chain face disruption. We believe that value pools will shift and we will see emergence of new business models and service opportunities," said Surya Ramkumar, partner at McKinsey & Company, and co-leader of McKinsey & Company’s Future of Mobility Initiative. While the mobility sector is still in the early days of transformation, change is poised to accelerate. 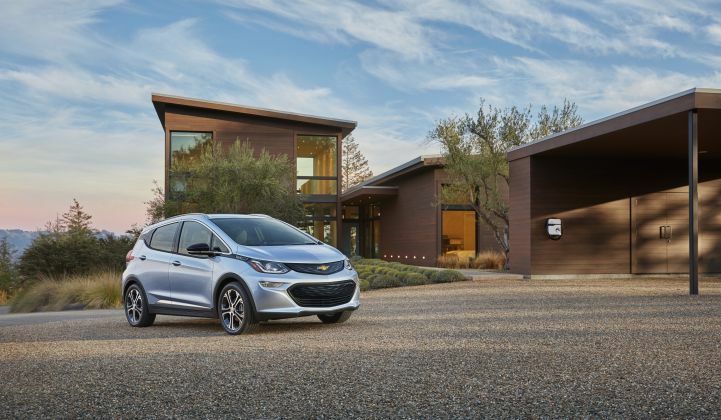 Worldwide EV sales rose 60 percent in 2015 alone to nearly 450,000, up from 50,000 EVs sold in 2011. Meanwhile, the average price of lithium-ion battery packs, the chemistry currently used in EVs, fell 65 percent over the period 2010 to 2015 -- from $1,000 per kilowatt-hour to $350 per kilowatt-hour. The Department of Energy and companies like Tesla and General Motors are working to bring costs even lower. If the 50 metropolitan areas studied take an incremental pathway, the cumulative market size for EVs between 2015 and 2030 would rise to an estimated 180 million vehicles, out of 1,700 million total light vehicle sales. But if cities accelerate rapidly, global EV sales over the same period could reach around 240 million. As EVs are becoming more affordable, shared mobility services are becoming more accessible, which is expected to drive even greater EV adoption. Researchers found investments in ride-hailing companies topped $11 billion in 2015, and totaled $21 billion by mid-2016. Companies such as Uber and Lyft are seeing rapid uptake in the U.S. market, while companies in China, like Didi Chuxing, are also experiencing high growth. When it comes to autonomous vehicles, while some consumers are still apprehensive, technology developments and plans already announced by auto manufacturers make it likely that fully self-driving vehicles will be available by the mid-2020s. Depending on the actions cities take, the market size for self-driving vehicles could reach 55 million to 60 million units between 2015 and 2030. However, if cities accelerate adoption, this share of highly autonomous vehicles (with Level 3 and Level 4 capability) could amount to roughly 50 percent of passenger vehicles sold in 2030. 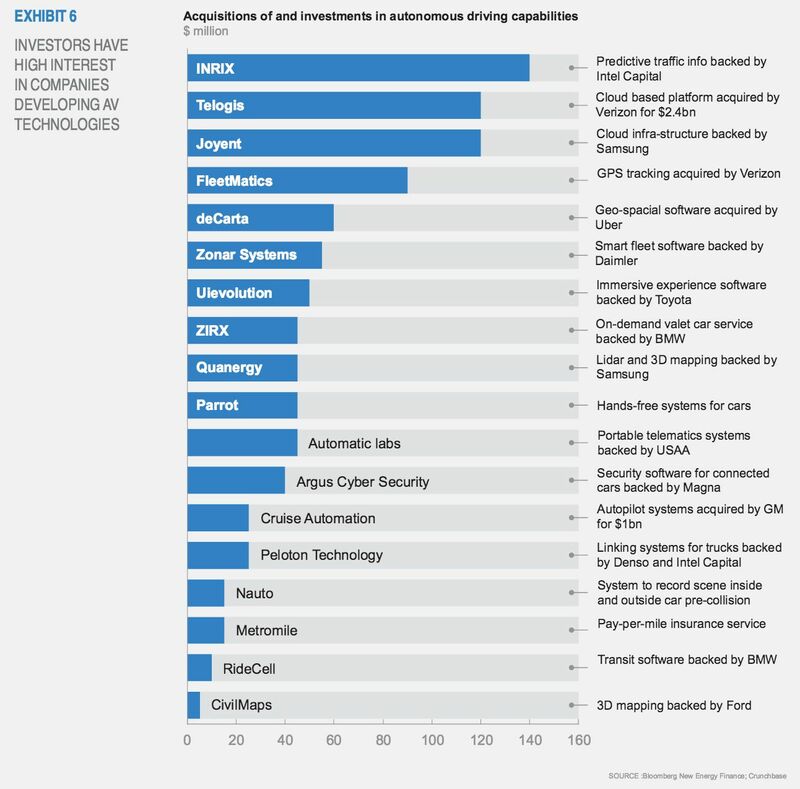 As part of the effort to achieve full autonomy, startups are working on components ranging from imaging and sensing hardware to communication modules for wireless connectivity, mapping, and driving data storage, as well as rental and insurance services optimized for a world with autonomous cars seeing record levels of investment. These new mobility trends bring new opportunities, but also a number of challenges, and not only for companies working in the sector. One side effect stemming from high levels of electrification in the Seamless Mobility or Clean and Shared models is that local governments could see fuel tax revenues from vehicles fall by 20 percent to 65 percent if taxation systems remain unchanged. In order to capture the benefits of new technologies and mobility trends, the report concludes that governments need to partner with the private sector, craft regulations that are in sync with technology and ahead of consumers, and take an integrated perspective when considering ways to incentivize and manage changes to the mobility system, rather than looking at each emerging mobility trend in isolation. "Appreciating the interdependencies and reinforcing effects between trends is crucial to understanding the potential pace and impact of change, to analyze the tradeoffs, and to lay out a clear path forward that balances the upside with potential adverse effects," the report states.